The Devoted Classicist has not retired, merely busy with a major John Tackett Design project that requires his undivided attention. But here is a brief break to recognize the terrific new book just released by long-time friend and colleague Thomas Jayne. 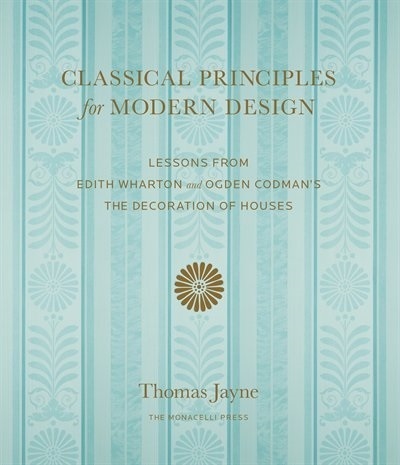 CLASSICAL PRINCIPLES FOR MODERN DESIGN is Thomas' answer to the game-changing 1897 book by Edith Wharton and Ogden Codman, Jr., THE DECORATION OF HOUSES, that is arguably the basis for our current concepts for interior design. This new book follows the same chapter organization as the original, giving guidelines for walls, doors, windows and curtains, etc., plus new chapters that address kitchen design and color. The Great Room in a house at Oyster Bay, Long Island. Photo via Jayne Design Studio. 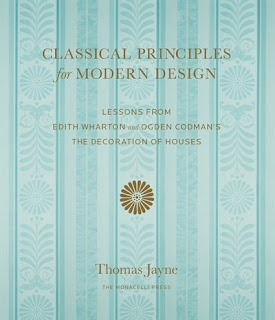 CLASSICAL PRINCIPLES FOR MODERN DESIGN uses new photographs, most taken expressly for this book, of projects by Jayne Design Studio New York to illustrate the points. There are some scheduled lectures and book signings that should not be missed if the opportunity arises at a location near you. See the news at the office site Jayne Design Studio New York news. Readers' support of The Devoted Classicist blog is greatly appreciated. It is a non-monetized site and under constant attack by pirates who would like to change that with ugly advertisements, so please stay alert to this original site as linked in the previous sentence. But, for short notes between blog posts, feel free to follow me on Instagram as @thedevotedclassicist. P. Gaye Tapp, author of the blog Little Augury, has just released a wonderful new book HOW THEY DECORATED, INSPIRATION FROM GREAT WOMEN OF THE TWENTIETH CENTURY. 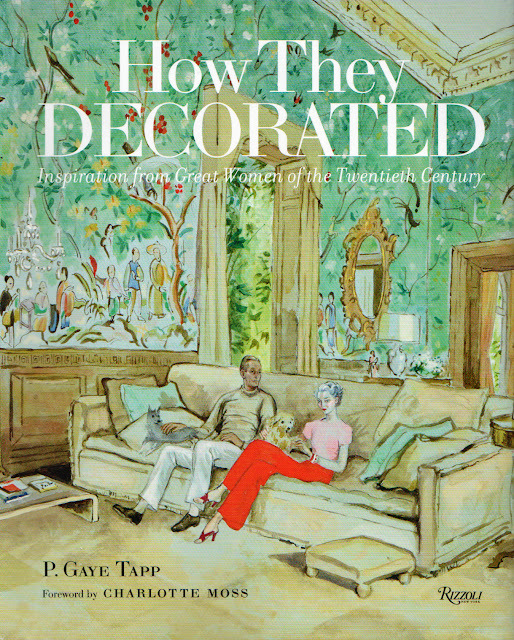 It is not a book about Lady Decorators, but about the women whose personal style influenced interior design, sometimes working with a design legend, but other times working on their own. Photo: Horst P. Horst, Architectural Digest. The book is organized into four sections. "Legacy Styles" features a chapter each on Lady Diana Cooper, Evangeline Bruce, Louise de Vilmovin, and Sybil Connoly. "In the Grand Manner" presents the interior of the homes of Helene Rochas, Gabrielle van Zuylen, Mona Harrison von Bismark, and Pauline de Rothschild. "Fashionably Chic" shows the residences of the fashion plates Babe Paley, Elsa Schiaperelli, Fleur Cowles, and Pauline Trigere. And the final section, "Unconventional Eye" discusses Bunny Mellon, Dominique de Menil, Georgia O'Keffe, and Lesley Blanch. 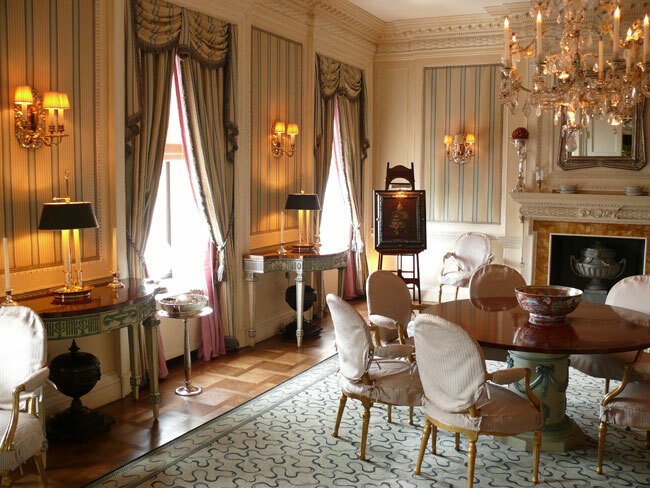 that formerly belonged to the style-setter Carlos de Beistegui. 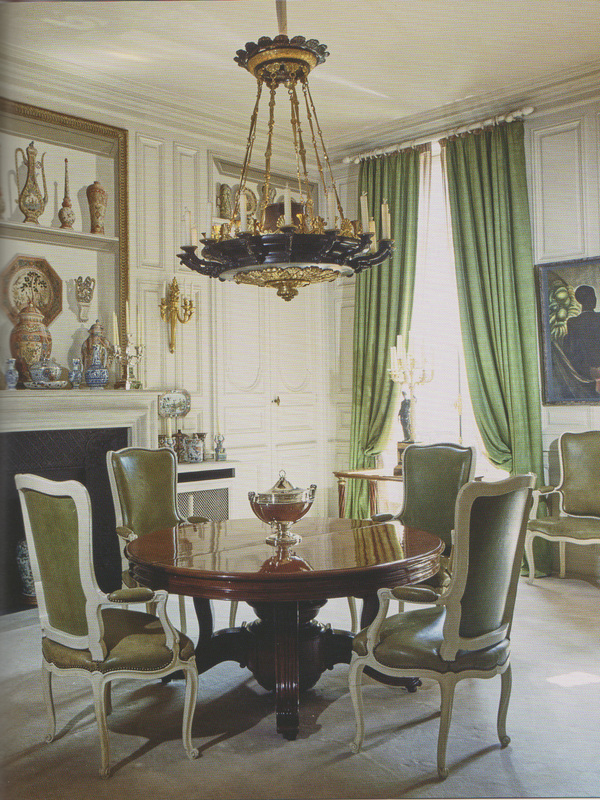 Photo: Pascal Hinous, Architectural Digest. The Devoted Classicist has read the book cover-to-cover and throroughly enjoyed it. 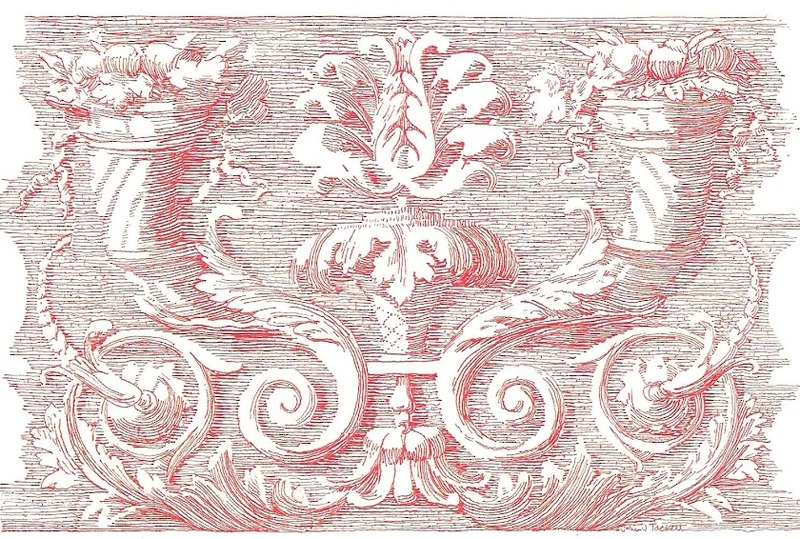 All interested in the history of decorative arts are sure to appreciate HOW THEY DECORATED published by Rizzoli International Publications, Inc., the source of all images used here. 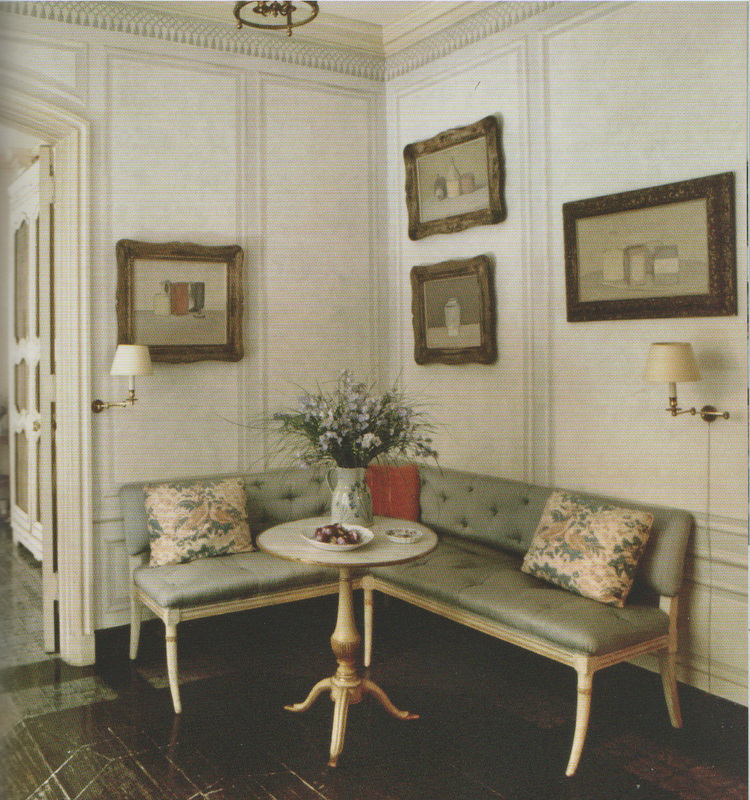 a transition space between the two decorating schemes. Photo: Michael Dunne, The Oak Spring Garden Foundation. It is hoped that all in the Baltimore area can join me on the evening of April 12, 2017, at Evergreen Museum & Library, 6:30 pm. John J. Tackett will speak on the topic of the legendary firm Parish-Hadley and how it served as a training ground for me and dozens of other interior designers and architects. 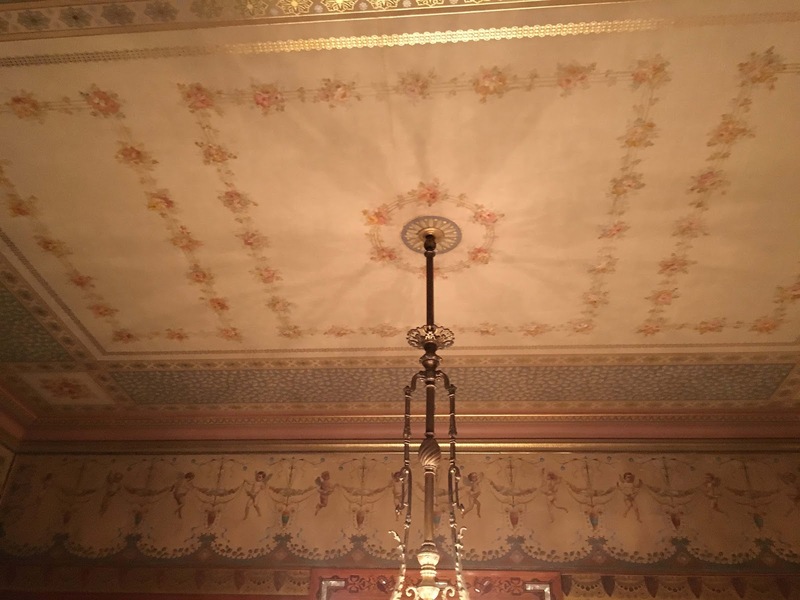 I will also discuss current trends in residential architecture and design and take audience questions on the subject -- with cocktails and a light supper -- all in the beautiful Bakst Theatre in historic Evergreen Mansion, 4545 N. Charles Street, Baltimore, Maryland 21210. 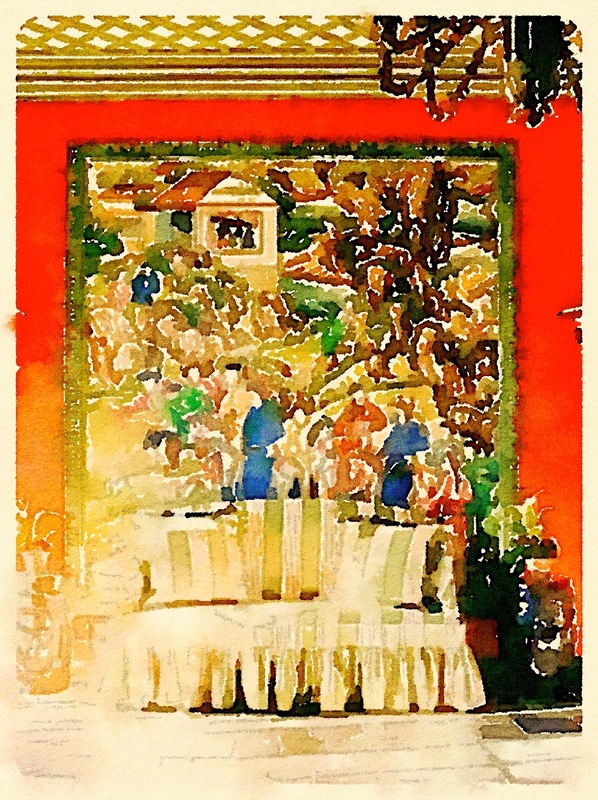 The event is part of The House Beautiful Lecture Series of Johns Hopkins University. Advance registration is required. For more information and tickets, click here. for The Devoted Classicist blog. The Devoted Classist has been happily occupied by a large John Tackett Design architectural project and has not found the time to post here as often as he would like. But there are still many topics in the cobwebs that will be realized here in the future. In the meantime, you can also follow @thedevotedclassicist on Instagram. Many thanks, Devoted Readers, for your loyal following, and best wishes for the holidays. 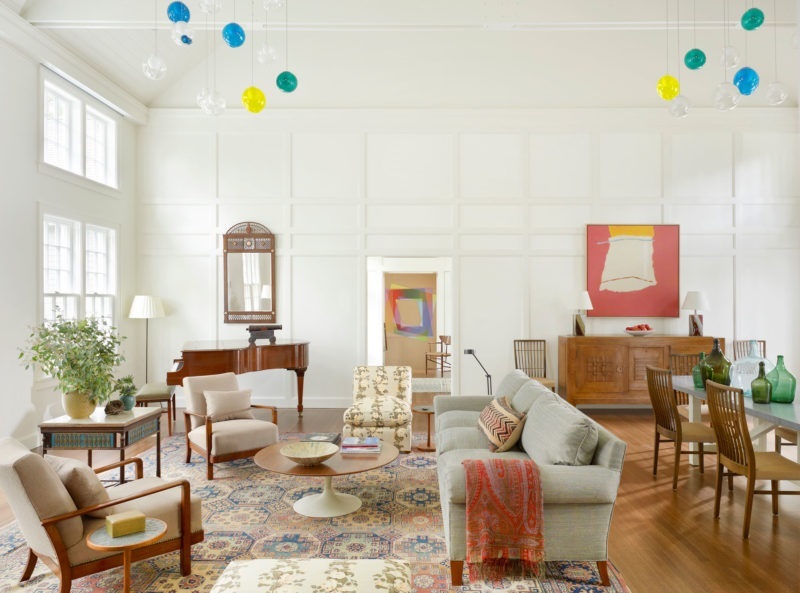 1970s interior design is more influential in today's work that many of you readers of The Devoted Classicist might realize. The concept of a mix of antiques with sleek custom furniture, contemporary art, geometric carpets, and architectural artifacts is universally championed today as the Latest Big Thing in interior design. 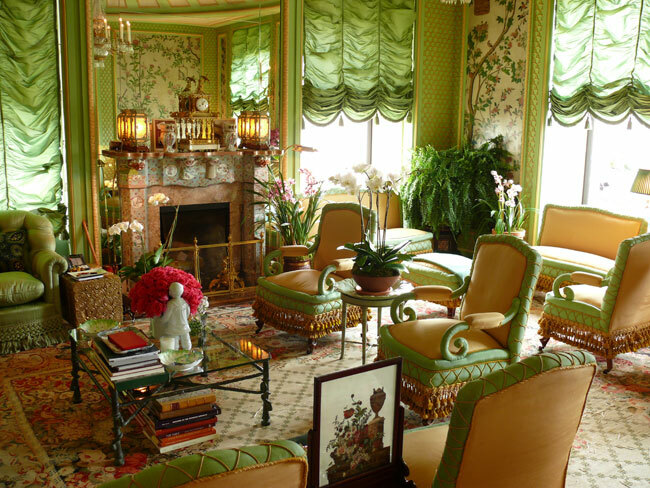 The formula, however, is a classic that was perfected over forty years ago by legendary decorator Billy Baldwin. Mary Wells and Harding Lawrence were terrific clients of Baldwin. Mary Wells was an advertising genius who was introduced some of the most memorable ad campaigns of the twentieth century and her husband was the CEO of Braniff Airlines which experienced phenomenal expansion with a chic make-over in the late 1970s. Between the two of them, both workaholics who combined business with pleasure in entertaining their contacts, they associated with the elite movers and shakers of the day. 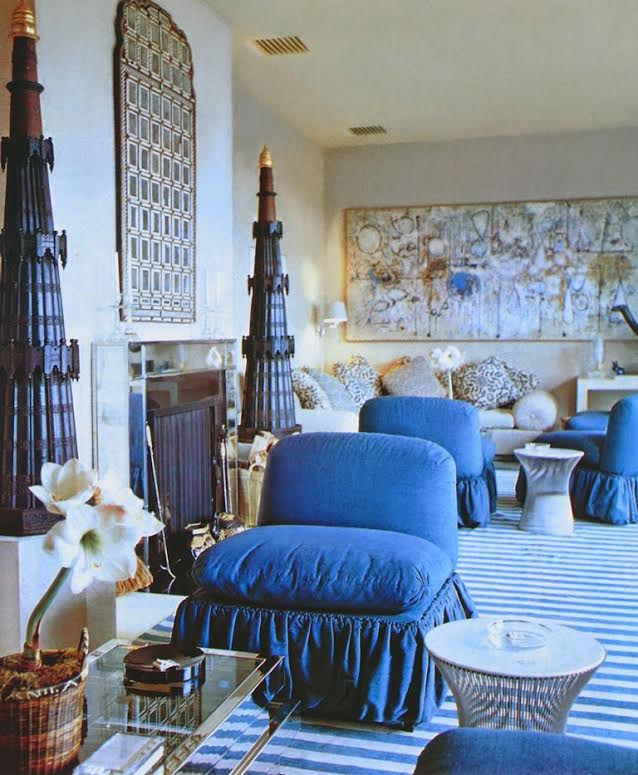 Billy Baldwin decorated beautiful homes for them. Their Dallas mansion was a landmark and their Riviera villa was among the most stylish ever. 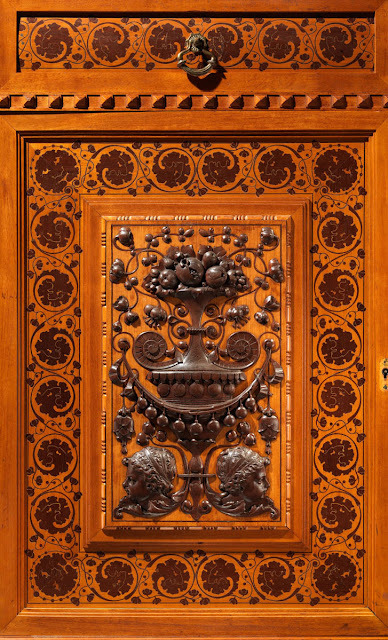 (See The Devoted Classicist's series of posts on the villa, La Fiorentina). 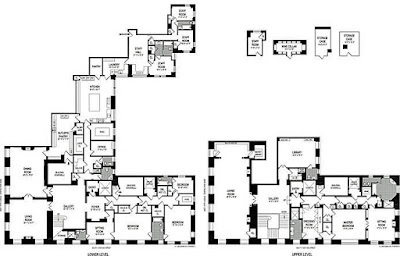 A room in their large New York City apartment is shown in the lead image, and like the other residences, it has provided design inspiration to this day. A bold striped dhurrie provides a base for arrangements of comfortable upholstered seating and a scattering of Warren Platner side tables. Contemporary paintings and a Moroccan mirror over a mirrored interpretation of a Louis Seize chimneypiece blend with masterfully with Baldwin's expertise. 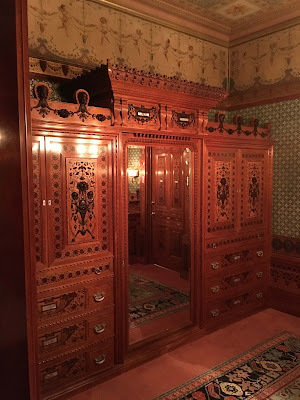 But perhaps the most memorable element in this room -- to my eye anyway -- was a pair of intricately detailed architectural finials on simple, white hexagonal stands. It was a delightful surprise to see these finials, with their stands, show up again. 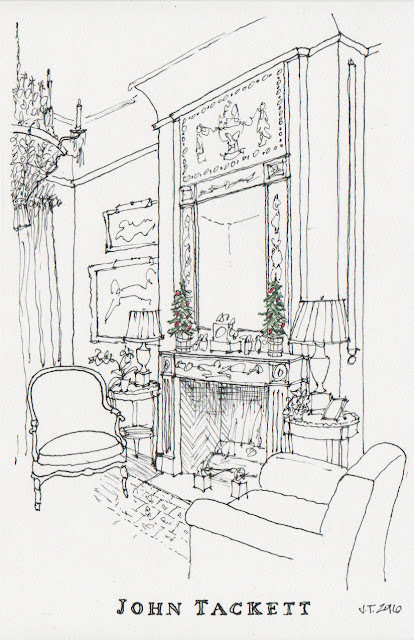 They again flank a fireplace and provide the primary architectural detailing in a room decorated by Charleston designer Amelia Handegan. 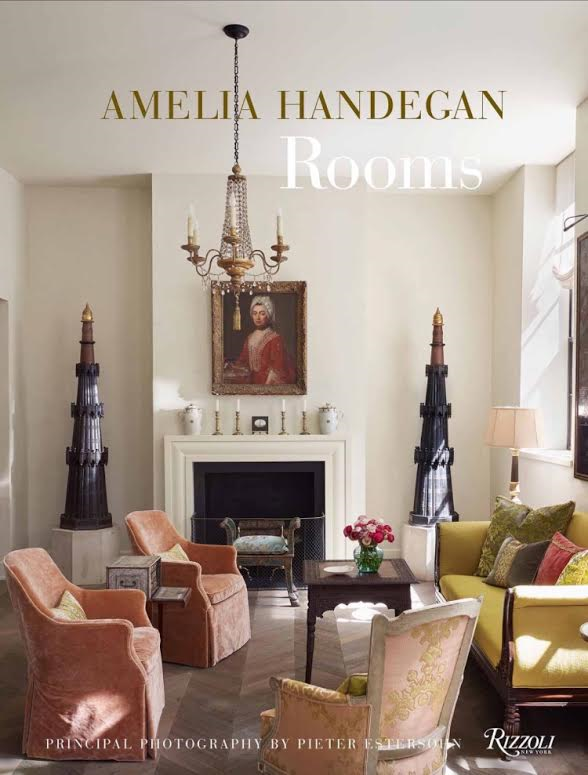 This undeniably fresh and up-to-date room appears on the dust jacket of the new book AMELIA HANDEGAN ROOMS. The book will be released October 16, 2016, but can be ordered now at a discount by clicking on the title. Remember that an appreciation of the iconic rooms of the past can be a valuable lesson in architecture and interior design today. Search this blog to see other examples in The Travellers series. for Arabella Worsham's Dressing Room. Photo: Metropolitan Museum of Art. The Devoted Classicist is a long-time fan of museum period rooms. For a time, these installations had fallen out of favor due to their cost and space required for a successful display. But it is heartening to a Traditionalist to see a major institution step forward with a new installation with artifacts that have languished in storage for years: The Worsham-Rockefeller Dressing Room at the Metropolitan Museum of Art. 4 West 54th Street, New York City. 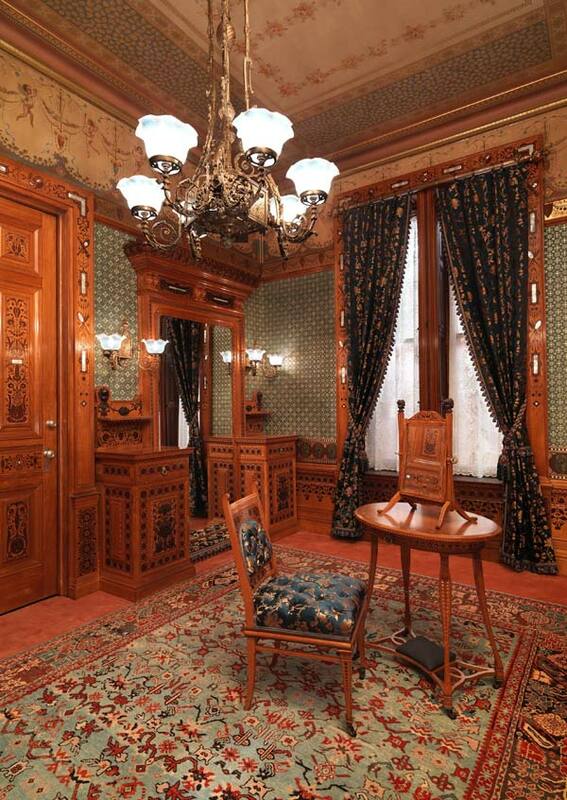 Commissioned by Arabella Worsham (later Huntington) as part of a comprehensive interior renovation of an existing brownstone townhouse, the room is a rare surviving Gilded Age commission from now-little known cabinetmaker/decorator George A. Shastey in 1881. The room comes from Worsham's house at 4 West 54th Street, a property that also included the two flanking lots; the site is now the garden of the Museum of Modern Art. Arabella "Belle" Worsham's background is a bit sketchy and possibly 'sanitized' to say the least. Born Arabella Duvall Yarrington in Union Springs, Alabama, around 1850, she grew up in Richmond, Virginia, a tough but bustling town during the Civil War years. 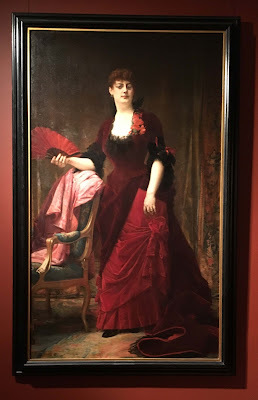 Her widowed mother owned a boarding house and Arabella was said to have married John Archer Worsham when she was 18 or 19 and soon widowed before having a son. But married or not, J.A.Worsham was already married and very much alive, owning a gambling card parlor in Richmond frequented by Collis B. Huntington leading up to his 1869 purchase of the eastern leg of his railroad empire which stretched coast to coast. Although not a drinker or smoker, Huntington loved to gamble and he had an eye for young women although he was married with a wife living on Park Avenue at 38th Street, New York. 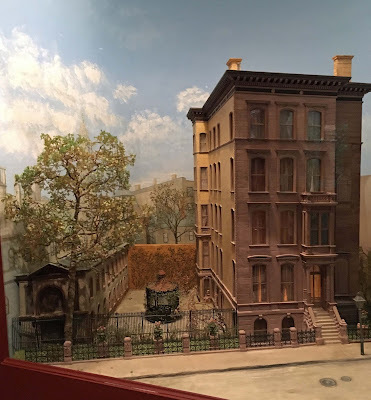 Soon Arabella, her son, several siblings and her mother were installed in Manhattan where they bought several properties financed by Huntington but always in Arabella's name, leading up to the purchase of this house. Arabella had the house gutted to the exterior shell and set about having luxurious interiors installed in the latest taste, with expense not being an issue. The house was one of the first private residences to have a passenger elevator, just one of many innovations for the time. 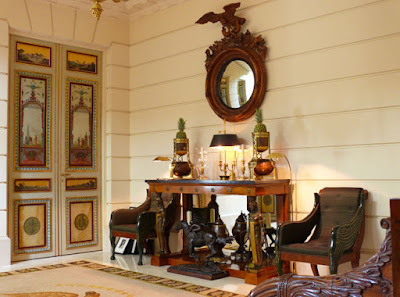 The Dressing Room is a high-style example of Aestheticism, a combination of European Renaissance, Islamic, Japanese and Modern styles mixed to create a luxurious private environment for the lady of the house. Satinwood and amaranth (or dark purpleheart) are used to create intricate marquetry in geometric patterns and motifs such as sewing implements and hairdressing tools as well as jewelry plus carved detailing with cherub heads, swags and garlands. Photo: The Metropolitan Museum of Art. 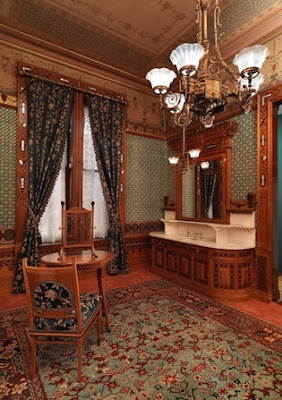 A wide, marble-topped lavatory is placed beneath a massive mirror and a secondary gaslight fixture. 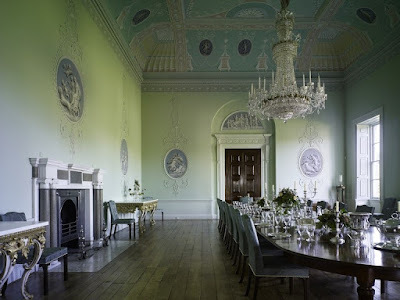 The upper walls are covered in teal wallpaper stenciled in gold and silver quatrefoils that shimmer in the subtle lighting. No detail was left without consideration. 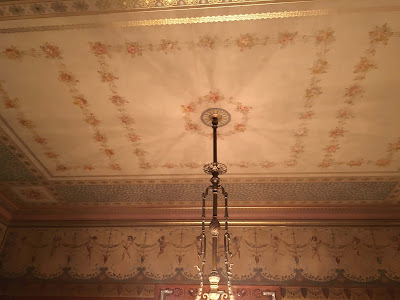 Even the ceiling had elaborately planned decoration. The silver toiletry set includes combs, hand mirrors, scissors, a needle case and a darning egg. All the elements add up to create a single Gesamtkunstwerk, a total work of art. as installed at the Metropolitan Museum of Art. 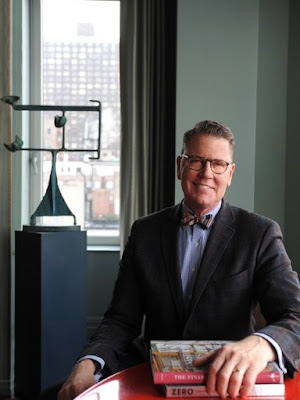 Photo by John J. Tackett for The Devoted Classicist. Huntington's wife Elizabeth died in 1889 after a long bout with cancer, allowing Huntington to marry Belle and adopt her son Archer; the ceremony was performed in the home with Reverend Henry Ward Beecher, brother of Harriet Beecher Stowe, officiating. They moved into Huntington's Park Avenue house (and then building a house in 1893 at Fifth Avenue and 57th Street on the site now occupied by Tiffany & Company) and the house was sold fully furnished to John D. and Laura Spelman Rockefeller. 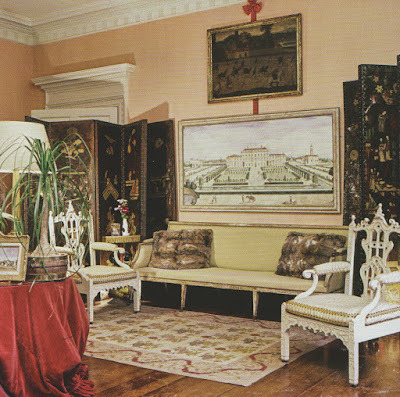 The furnishings and decorations were kept intact until his death in 1937 when parts were distributed to museums before being demolished in 1938. A Moorish-style Smoking Room was given to the Brooklyn Museum and this Dressing Room and adjacent (Master) Bedroom were given to the Museum of the City of New York. 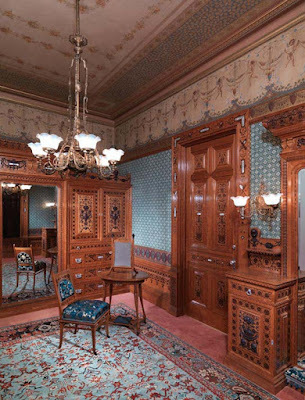 After it became clear that the latter could no longer display the rooms, the bedroom was given to the Virginia Museum of Fine Arts and this dressing room was given to the Metropolitan Museum of Art. 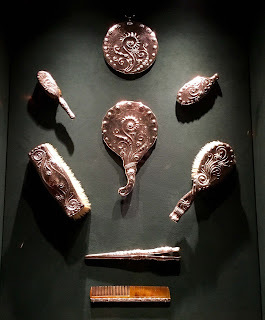 as displayed at the Metropolitan Museum of Art. After Collis Huntington's death, Belle inherited one-third of his estate, $150 million (about $3.1 billion today) making her one of the wealthiest women in the country. 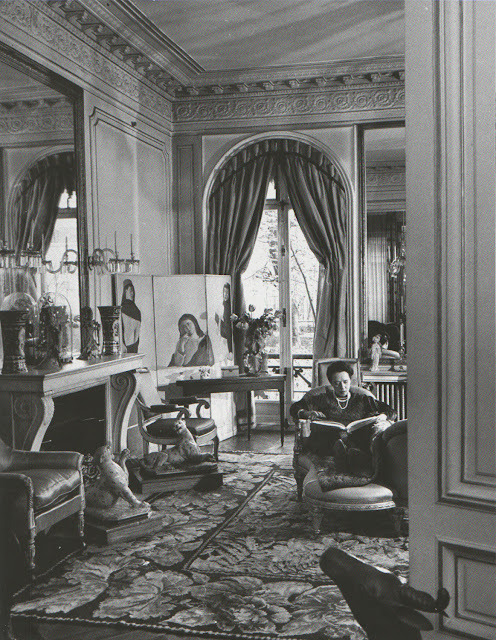 Never really part of New York Society, she bought a 14 bedroom house in Paris that underwent a complete renovation and became even more interesting in collecting art. Thirteen years later, she married her late husband's nephew, Henry E. Huntington, who had built a lavish estate in San Marino, California, some say to woo her. But she did not care for the area and never spent more than a month there for the rest of her life. That estate is now the Huntington Library, Art Collection and Botanical Gardens. Arabella Worsham Huntington is buried in the San Marino garden in a classical mausoleum designed by architect John Russell Pope. Winter Garden room at 834 Fifth Avenue. Considered by many to be Manhattan's most luxurious co-op apartment, Susan Gutfreund's duplex at 834 Fifth Avenue has hit the market with a listing price of $120 million. The widow of John Gutfreund, dubbed "The King of Wall Street" and former CEO of Saloman Brothers investment bank until a trading scandal forced his resignation in 1991, is apparently looking to down-size after her husband's death last month. from the Brown Harris Stevens listing, April, 2016. The apartment was decorated with the guidance of the legendary designer Henri Samuel whose influence can be seen especially in the Winter Garden, a reception room at the southwest corner of the entrance level. 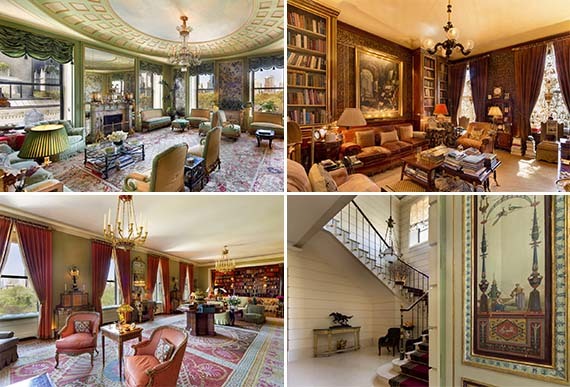 The building is one of Manhattan's most prestigious addresses. Designed by architect Rosario Candela in 1929, it was completed in 1931.
apartment at 834 Fifth Avenue. 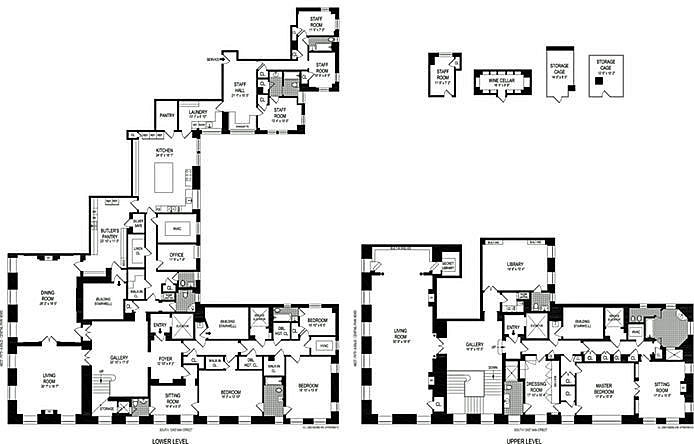 There are twenty four apartments on 16 floors with luxurious, well thought out, floor plans. It is thought that the building's board requires that sales are all cash; no mortgages are allowed. at 834 Fifth Avenue, NYC. More photos from the 2008 New York Social Diary post may be seen here. The listing by Brown Harris Stevens may be viewed here.